It’s not too late to have that fresh taste of summer preserved for winter. 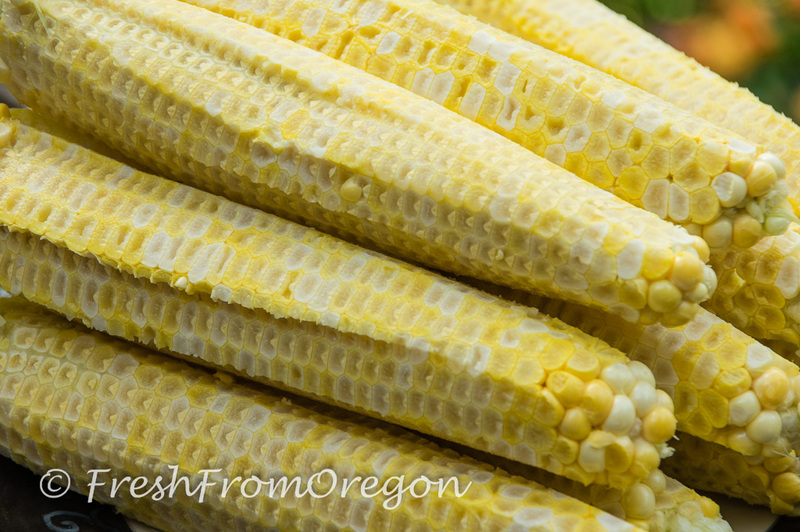 Corn is still in season and combined with peppers, onions and celery it makes the perfect relish. Served over some grilled chicken, steak or added to cooked rice, the flavors will make any dish have that fresh taste of summer. This is also great as a side dish served cold or hot. 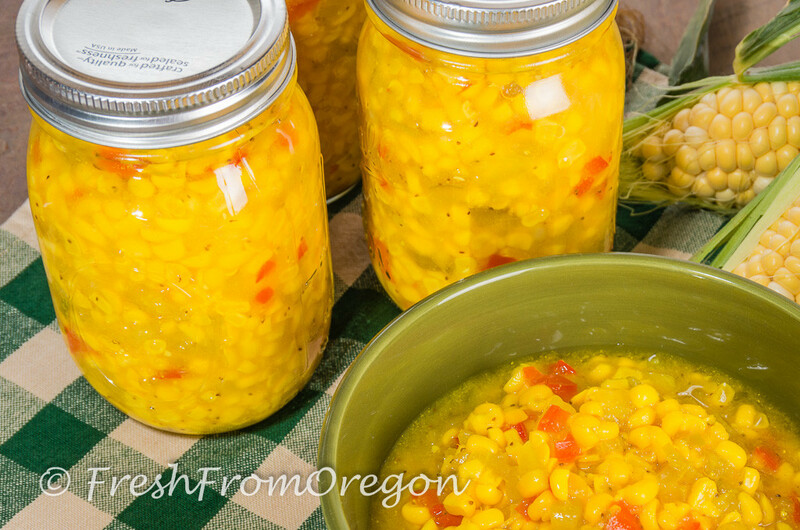 I like to enjoy this relish throughout the winter so I preserve some jars when the corn is fresh. During the cold winter months I can open up a jar and have that fresh taste of summer. When making the corn relish I used my new Crisp™ Corn Stripper. 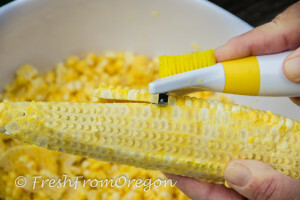 WOW did this work fast and easy getting all the corn off the cob. 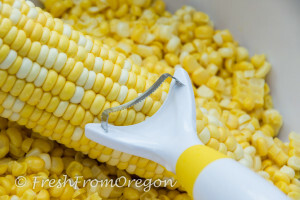 The extra sharp curved blade that conforms to the shape of the corn cob quickly separated the kernels. It is a 2 in 1 tool with the addition of the DESILKER. The sturdy nylon bristles gently remove dirt and stray silk strands leftover from husking the corn. Check out the pictures below to see how it takes off all the corn in less than 15 seconds. Shuck the corn and make sure you get all the silk off the ears. 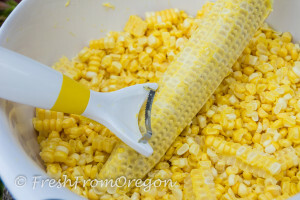 Cut the corn off the cobs, but do not scrape the cobs. Measure 8 cups of corn and put them in a sauce pan with 2 cups of water. 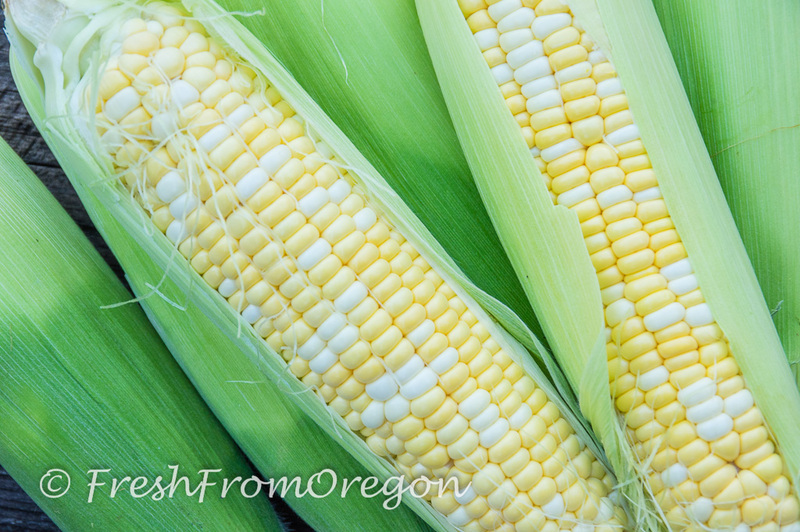 Bring to a boil; reduce heat and simmer, cover for 5 minutes or until the corn is almost tender. Drain the water off. 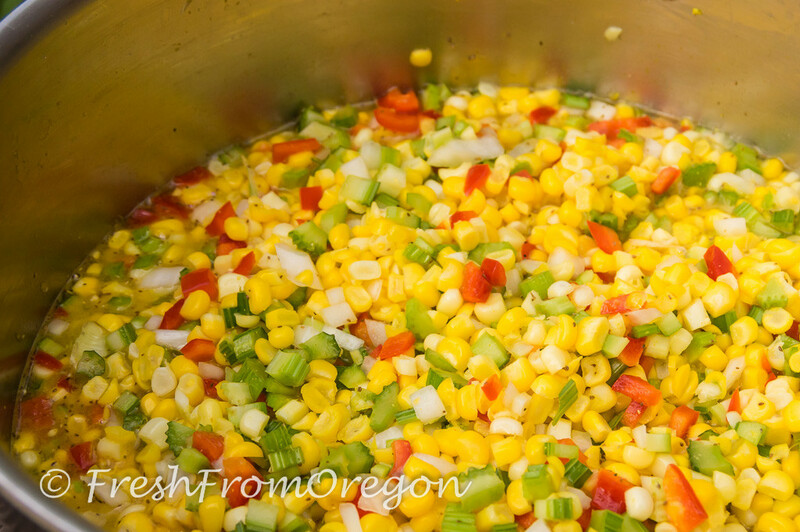 In the same pot, combine the cooked corn, celery, peppers and onion. Stir in vinegar, sugar, mustard, pickling salt, celery seeds and turmeric. Bring to a boil and let simmer for 5 minutes, stirring occasionally. Stir together cornstarch with 2 tablespoons water; add to corn mixture. Cook, stirring until slightly thickened and bubbly; cook and stir 2 minutes more. The mixture will start to thicken. This will yield about 5 pints of corn relish. You can place in jars and refrigerate to use later or if you want a longer shelf life see the following directions. Prepare 5 pint jars by sterilizing them. Ladle the hot relish into jars. Leave a half inch of head space. Wipe the jar rims with a clean towel and top with lids and bands. Process filled jars in a boiling-water canner for 15 minutes. Start timing when the water returns to a boil. Remove jars; cool on wire racks and then store in a cool, dark place. Refrigerate after opening.